When I met Brian, I knew my life would never be the same. He lived his life the way I always dreamed my life could be but never thought how I could get there. His free spirit and quest for adventure is one of the main reasons why everyday of our life together has been more fulfilling than my past 50 years. 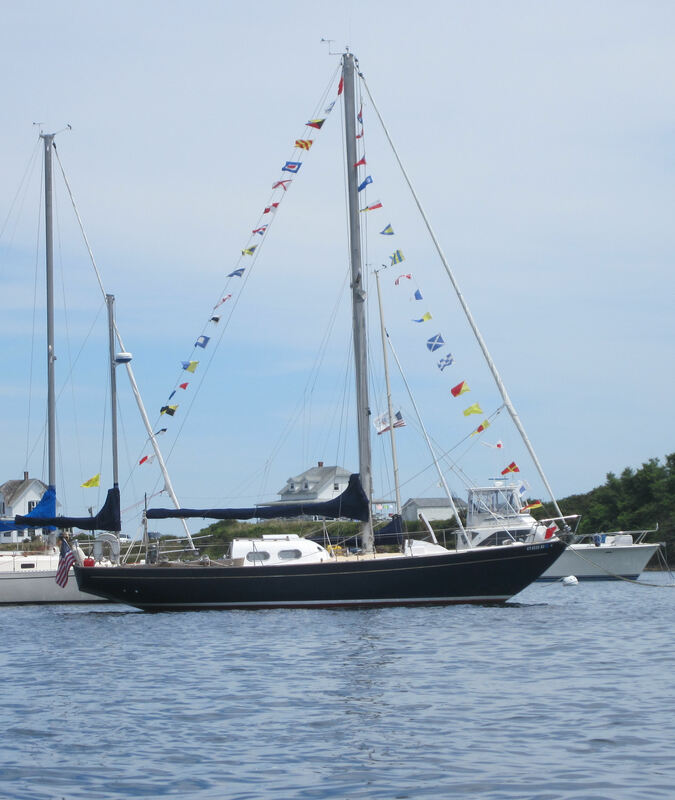 He talked about his dream of going cruising one day and then he began my education with sailing Scout and what a cruising life really entails. Most would not think a plant closure would be a blessing but it was to us. When Brian was told his job of 27 years was about to end, we both looked at it as the permission we needed to set our dreams into motion. We have taken our beautiful boat and made her a very large non-floating piece of fiberglass, but the vision has to be there and we can both see how the finish project is going to be so perfect for our 3+years of cruising. This was a very emotional decision to rebuild Scout. We spent numerous sunsets and sunrises on this boat, sailing with friends and families, making great memories including getting married on her bow. The logical, intelligent thing for us to have done is sell Scout and buy a newer boat, but I have an amazing confidence on Scout that I do not experience on any other boat. The decision was a no brainer, Scout is going south with us! For most people, the decision to go cruising is crazy. For me, the decision to go cruising was the easy thing, but getting rid of most of our possessions was the crazy thing. When all of this started, there was a condo, house, 2 cars, 5 bikes, multiple watercrafts, and a whole lot of things in boxes in the basement. Where was I going to start to get this daunting task under control? Of course, I read a lot on the cruising forum, checked out numerous books on the cruising life, and found 2 books on kindle that made the most impact on how I spent the last year. The first book is by Ed Robinson (another cruiser) called ‘Leap of Faith, Quit your job and live on a boat’. This book detailed how Ed and Kim did exactly what Brian and I were planning to do. They got rid of the American Dream, and moved onto the boat of their dreams. Another book was by Betsy and Warren Talbot, ‘The Step-by-Step Guide to Getting Rid of it’. This book explained how to go about getting rid of my junk on ebay and craigslist, and make money doing it. With everything I read, we made about $2000 from what I called junk and then donated the rest to Goodwill for a great tax credit. The condo was sold, Brian’s Ford Mustang went as well (with a tear in his eye), the house is on the market, and the rest of the stuff will go as soon as we have the house sold. 1. What is your dream? Maybe it is riding a motorcycle across Europe or driving an RV across America, but have a dream. If you do not have a dream, you are walking dead. 2. Figure out what 3 major things you need to do to make your dream come true and decide if those 3 things are doable. 3. Determine what part of American marketing you can get rid of. My big thing was spending $2.25/day for a cup of Dunkin’ Donuts coffee. Instead, I switched to making coffee at home, and carrying a thermos. But do you really need that new TV or video game? Anyone who knows me how very small my TV is, but I can not bring myself to buy a bigger one because my small on works just fine. Do you need to spend $100 going out for dinner and drinks when you can cook a better and healthier meal at home? 4. Pay off debt. This is the big one. No one can live a dream with debt dragging them down. Brown bag your lunch every day and take the $25/week you save to pay off another bill. After a few years, you will be debt free. 5. Enjoy the journey to your dream, it is half the fun. Trust me when I say Brian and I are loving the steps we are taking everyday, knowing in 5 months we will be sailing. 6. And learn to accept defeat! This is our dream, hopefully we will be living it soon, but if we can’t we know we gave it our all. 7. Love the person you are living the dream with! This is important for us because Scout is small and we will be together alot! Good luck with your dream, and wish us luck with ours.